Jokingly, we at the Verbal Mosh had stated that the only reason to go see the Avengers was because the full and final Dark Knight Rises trailer was to be attached to it. Well, someone put the trailer online. As you may have heard us cover it in our podcast I won't go in to all of that again and my shenanigans with Catwoman... The trailer wasn't even shown, but quite honestly, after seeing the Avengers movie, I don't even care. This movie was really awesome. More than awesome. It was a rip-roaring good time. Basically, nasty aliens are attempting to invade Earth with the aid of Loki and the cosmic cube he steals from S.H.I.E.L.D so Loki can rub it in Thor's face how much better he is than him. Loki should have been king of Asgard, etc. The Avenger Initiative is pulled in to action by Nick Fury against the wishes of this super secret council, but who cares about them, right? They don't even show their faces so they're not important. The Team includes: Iron Man, Black Widow, Hulk, Hawkeye (who turns kind of evil at first but joins everyone in the end), Captain America, and Thor. Iron Man is my least favorite Avenger because he is an egomaniac. Cocky. Way too cocky. It's why my favorite moment with him is after he's let loose the giant bomb in outer space and is falling back down. It looks like he's going to die, and he hasn't been able to get in touch with Pepper Potts. The fact that it looked like the character was going to accept the outcome no matter what, if he made it back to Earth or not, made me empathize with the character. Black Widow was cool when she wasn't playing hostess to all the other Avengers. I enjoyed the scene at the beginning where she's tied to a chair and knocks out the men who think they're interrogating her. The Hulk was fantastic. It may have taken them a couple of tries but they finally found the right actor to play him: Mark Ruffalo. The scene where he first transforms and is after the Black Widow was INTENSE. It was so terrifying. I loved the interaction with the old man in the abandoned building. The Hulk fell out of the sky all big, green, and buck naked. And I just loved seeing him smash everything. Captain America was cool whenever he was jumping around. Thor and Hawkeye were all right too. I liked Hawkeye more when he was a bad guy, oddly enough, because he was a wrench in the good guys' plans. My biggest gripe with the plot was how easily problems were resolved. The worst being the resolution to close down the portal in the sky. Oh what? All you need is Loki's staff? Oh, look. There it is... Yay!... How could the scientist have built in a fail-safe if he was being manipulated like a puppet? Another moment of strangely simple solutions was the one to get people out of Loki's mind control: just bop them on the head really hard. So simple and it allows for more time to be given to the action sequences. Oh, and how could I have almost forgot one of the coolest sequences where Loki is about to throw a giant temper tantrum and the Hulk whacks Loki about like a rag doll?! It was awesome! Loki is taken into custody by Thor to return to Asgard with the cosmic cube. The Avengers go their separate ways, but if given the call, they'll all return and fight side by side again if the world needs them. Looks like they will because who was that at the end of the credits... Thanos: setting up to be the villain for the next sequel. Loki was wonderfully twisted in this movie. I really like Tom Hiddleston's smile. It's so evil. You know, with a smile like that, he's up to no good. 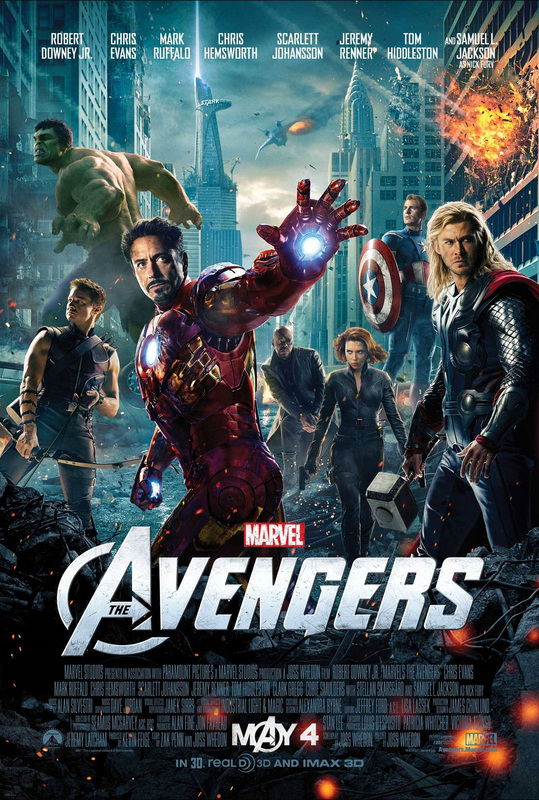 I had a lot of fun watching the Avengers movie. I'd give it 4.5 stars out of 5.